Mondays – 5 – 6.30pm The Wellbeing Rooms, Simon Building, The new semester starts Monday 29th April and you can book here. There will be three drop in classes, £6.50 each on 1st, 8th & 15th April. Mondays – 7.30 – 8.45pm St Elisabeth’s Church, Bedford Street, Reddish, Stockport every Monday, just £5 per class. Enter via the Tower entrance. Plenty of parking outside the church which is just on the green at the side of Houldsworth Mill. Classes every week, no classes on 22nd and 29th April 2019. Small groups and 1:2:1 lessons. 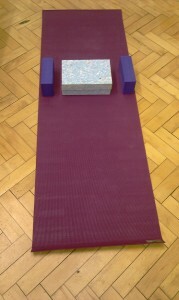 What a great way to deepen your practice, work on specific areas of your body and postures to help you as an individual. One to one or small group lessons are key to improving your practice and postures, you just need enough space to roll your mat out. You can come to me and my fully equipped yoga space or I can come to you and help encourage you to practice in your own home or work space. Currently full until 2020. Can anyone do Iyengar Yoga? How do you adapt postures? One of the unique features of Iyengar Yoga is the use of props, this allows students to achieve the correct alignment & develop strength and control. Wear comfortable clothes that do not restrict your movement, shorts or leggings and a t- shirt are fine but yoga must be practised in bare feet.